Mundubbera, a rural town, is on the Burnett River in the central Burnett region, 140 km west of Maryborough and 270 km north-west of central Brisbane. It was named after the Mundubbera pastoral run (1848), and the name is thought to derive from an Aboriginal expression describing step marks on trees. The town is of comparatively recent origin, as significant closer-settlement in the district did not occur until 1906-10. A locality east of Mundubbera, the Binjour Plateau, was settled by German families in 1908, who established both a school and a dairy factory a short time before Mundubbera. The extension of the railway from Gayndah in 1914 placed Mundubbera firmly on the map, and a separate shire (Auburn Shire) was created in 1915 by severance from Gayndah Shire. The Shire was named after the Auburn River which, along with the Boyne, joins the Burnett about 10 km upstream from Mundubbera. Mundubbera's primary school was opened in 1913, and such was the rate of growth in Auburn Shire another eight were opened by 1917. The southern part of the shire was affected by prickly pear infestation, but after eradication of the pest another six schools were opened during 1927-36. A butter factory opened in the town in 1916, while the agriculture, pastoral and industries association held its first show and a hospital was opened, both in 1921. Within about ten years the town's population had grown to probably over 500 people: the 1921 census recorded 431, plus '391 near', and Pugh's Queensland Directory estimated the population at 'about 1,000' in 1924. There were two hotels, an aerated waters manufacturer, the Queensland National Bank, three motor garages, two storekeepers and sundry other shops and two sawmills. By the 1930s the dairy factory had 400 local suppliers. In 1963 a secondary department was opened at the primary school. It followed on from the shire library (1959) and a new shire hall (1961). Pasture improvement, and increased productivity in dairies, piggeries, beef herds and cropping assisted the shire's primary industry, while the advent of 240 v electricity and associated home comforts and school buses improved town and domestic life. The shire's halcyon years were from 1945 up until 1970, when the rural Depression started, eventually spelling the end of the butter factory, which closed in 1980. Economic stability, however, has been provided by citrus orcharding, which started locally in 1936. By 1980 Mundubbera's citrus production exceeded Gayndah's, and Mundubbera today markets itself as Queensland's citrus capital, boasting the 'Big Mandarin' in support of its claims. In 1993 Mundubbera Shire had 1200 ha of orchards, compared with Gayndah's 900 (where citrus production began much earlier in the late 1800s). It also had 62,000 beef cattle, 3500 dairy cattle, 28,000 pigs and an area of 4199 sq km. In 2008 Mundubbera Shire was amalgamated with Biggenden, Eidsvold, Gayndah, Monto and Perry Shires to form North Burnett Regional Council. 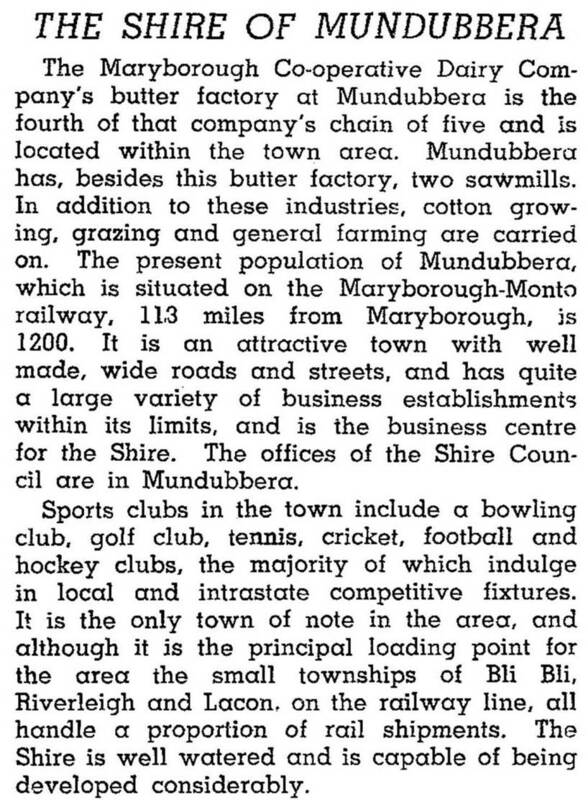 Mundubbera township has sports facilities (including a golf club) two hotels and a motel, a show society, a hospital, the combined State primary and high school, a civic centre, an historical society and a local shopping centre. On 28 December 2010 the Burnett River peaked at 18.9 metres, the highest since the record of 23.6 metres in 1942. Twenty or more houses were flooded, and surrounding farms were extensively affected. The town remained isolated until the new year. Damage to the town water- supply plant resulted in household water restrictions.